Trygfonden has allocated 48 million for research on functional disorders. The application deadline for the last 28 million kroner is 6 April 2010. Specialist in General Medicine Lene Toscano, Aarhus University Hospital, has received 3,336,458 kr. from TrygFonden to examine how best to communicate and share knowledge about functional disorders. In February, I published information on the status of current proposals for revision of ICD-10 “Somatoform Disorders” for the ICD-11 core version, as displayed in the ICD-11 Beta drafting platform, and on proposals for ICD-11-PHC, the abridged primary care version of ICD. In Part Two of that post, I compiled information on “Bodily Distress Syndrome,” a disorder construct developed by Per Fink and colleagues initially for research studies, now used in clinical practice at The Research Clinic for Functional Disorders and Psychosomatics, Aarhus. Francis Creed (member of the DSM-5 Somatic Symptom Disorders Work; member of the WHO Working Group on Somatic Distress and Dissociative Disorders, reporting to the International Advisory Group for the Revision of ICD-10 Mental and Behavioural Disorders; co-author book , paper ). Per Fink (The Research Clinic for Functional Disorders and Psychosomatics, Aarhus, Denmark, co-author book , paper ). Peter Henningsen (Co-author book ). The S3 guideline “Dealing with patients with non-specific, functional and somatoform bodily symptoms” emphasizes the similarities in the management of the manifold manifestations of so called “medically unexplained symptoms” and gives recommendations for a stepped and collaborative diagnostic and therapeutic approach in all subspecialties and all levels of health care. It has a special focus on recommendations regarding attitude, physician-patient-relationship, communication, the parallelization of somatic and psychosocial diagnostics and a stepped therapeutic approach. The “Evidence-based guideline psychotherapy in somatoform disorders and associated syndromes” provides a differentiated analysis of the current evidence regarding the effectiveness of various psychotherapeutic interventions for the most relevant manifestations of functional and somatoform disorders. In combination, both guidelines pose important advances for treatment quality in Germany, but also illustrate remarkable structural and research deficits. This article introduces the new Danish Association for General Practitioners (DSMA) guide for general practitioners, published this May. The Working Group for the guide, which included Per Fink, was chaired by Marianne Rosendal. An alternative construct, called Bodily stress syndrome (BSS), has been put out for international primary care focus group evaluation by the working group for the revision of ICD-10-PHC (the abridged primary care version of ICD-10), and will be undergoing ICD-11 field testing and analysis. There is no public domain information available on where BSS will be field tested or on field trial study design, patient selection, criteria etc. Although ICD-11 is at the Beta drafting stage and scheduled for WHA approval in 2015, the public version of the Beta drafting platform has yet to define this proposed new BDD category, characterize its three, proposed severities: Mild; Moderate; Severe, or populate any of its “Content Model” parameters. It has sat there since February 2012, a tabula rasa. At the time of writing, it remains unspecified which disorders BDD is proposed to capture. It isn’t clear whether its criteria are proposed to be based on unspecified somatic symptoms, symptom counts or specific constellations of symptoms (eg gastrointestinal, musculoskeletal); whether psychological or behavioural responses are central to its definition; whether it is intended to be inclusive of selected of the so-called “functional somatic syndromes”; whether, like DSM-5’s SSD, its reach would be extended to include patients with somatic symptoms in association with diagnosed diseases, such as cancer or diabetes. 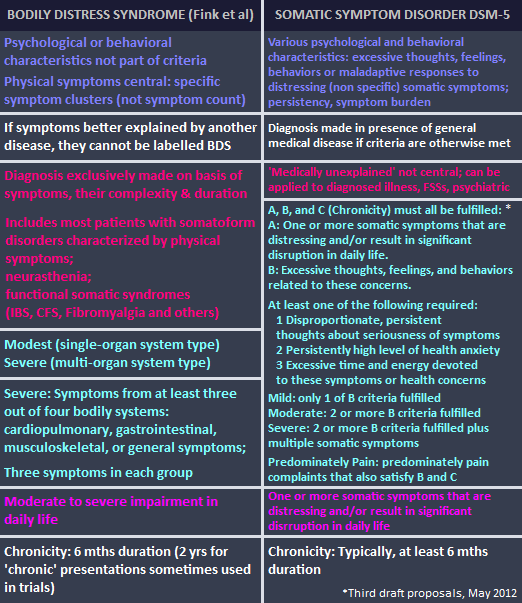 It is not possible to determine from what little information displays in the public version of the drafting platform whether ICD-11 proposes that BDD would mirror or incorporate Per Fink’s construct of “Bodily Distress Syndrome” for definition, criteria, severity specifiers, inclusions, exclusions etc; or whether it intends BDD to also incorporate DSM-5’s “Somatic Symptom Disorder” (and if so, how might this be achieved, since BDS and SSD lack congruency); or whether a unique definition for BDD is being developed and tested specifically for ICD-11. Until ICD-11 defines BDD, it presents barriers to professional and lay stakeholders inputting meaningful comment on this proposal, which has remained undefined for over a year. If the working groups advising ICD-11 Revision are putting forward a Per Fink “BDS” model for BDD, or an adaptation of Per Fink’s model, it is not known how WHO classification experts view any proposal that might seek to shift several, discrete, ICD-10 categories with long-standing classification locations outside the Mental and behavioural disorders chapter of ICD, into Chapter 5, and subsume them under a new disorder construct, for which there is no body of evidence for its validity as a construct and safety of application outside research settings. Note that the ICD-11 Beta draft is a work in progress: proposals for new disorders for ICD-11 are subject to field trial evaluation and approval by Topic Advisory Group Managing Editors, the ICD-11 Revision Steering Group and WHO classification experts. What is “Bodily Distress Syndrome”? The Per Fink et al construct of BDS is a unifying diagnosis that encompasses a group of what are considered to be closely related conditions such as somatization disorder, fibromyalgia, chronic pain disorder, irritable bowel syndrome, chronic fatigue syndrome and ME, multiple chemical sensitivity (MCS) and whiplash associated disorder. On some BDS presentation slides, “Stress and burn out…and many more…” are added to the list. In May 2010, Per Fink and Andreas Schröder, PhD, MD, Aarhus Universitetshospital, Denmark, published the paper, “One single diagnosis, bodily distress syndrome, succeeded to capture 10 diagnostic categories of functional somatic syndromes and somatoform disorders.” [Abstract: PMID: 20403500]. is expected to be integrated into the upcoming versions of classification systems. Note: This proposal by Fink, Rosendal et al has three hitherto discrete ICD-10 classifications, Fibromyalgia (M79.7), IBS (K58) and Chronic Fatigue Syndrome (indexed to G93.3 in ICD-10; classified in ICD-11 Beta draft as an ICD Title term within ICD-11 Chapter 6: Diseases of the nervous system) proposed to be relocated under the ICD-11 mental and behavioural disorders chapter (Chapter 5) and subsumed under a single new disorder classification, “Bodily Distress Syndrome,” along with Neurasthenia (F48.0), Hypochondriasis and some other ICD-10/DSM-IV Somatoform Disorders.